Developed by Roll7 and published by Curve Digital OlliOlli is a fast-paced 2D sidescrolling skateboarding title that has been critically acclaimed by the press and is as tough as nails, but what did we think of this unique title? Continue reading our review to find out! The gameplay is simple yet incredibly difficult and will challenge even the most avid of gamers! The trick system is linked to the d-pad buttons with the A button being linked to the landing. You must not only perform tricks, but also perfect your landing skills in order to rack up some big points! The stages start off surprisingly challenging and become nightmarishly difficult later on in the game so this title isn't for casual gamers! The loading time for the title screen is unacceptably long, but only when you boot the game up. 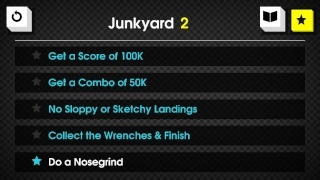 There are also daily grinds to test your skills against other OlliOlli players and it's a nice addition to the game! The controls take some getting used to, but aren't overly difficult to master and the Off-TV-Play feature is flawless in this title which is nice! The graphics in the game are varied and get the job done, but don't expect to be blown away by the visuals. The music on the other hand doesn't have alot of variety, but it's nice nonetheless. The game's various sound effects such as grinding on rails, cheering crowds, etc. add a great retro vibe to the game! 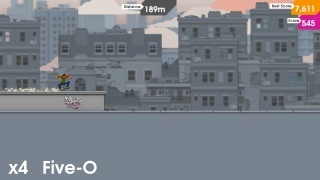 OlliOlli has great, but incredibly challenging gameplay, controls that take getting used to, and a simple yet effective audio-visual presentation making it a fairly solid title, however incredibly long loading times when you first boot the game really hurt the flow of the game. 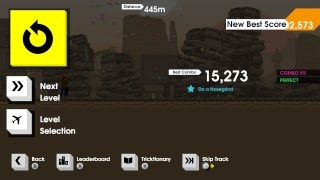 All-in-all OlliOlli is a solid game that is unique and funt to play so we do give the game a solid recommendation! This isn't something I would enjoy, but it seems like a decent enough game! Nice review @Rukiafan.